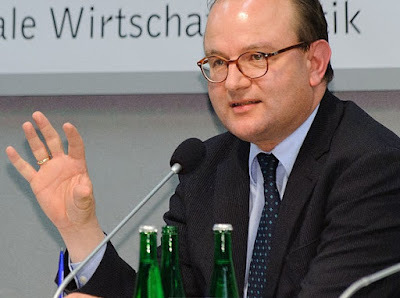 [[Ottmar Georg Edenhofer]] (born in 1961 in Germany) currently holds the professorship of the Economics of Climate Change at the Technical University of Berlin. He is deputy director and chief economist of the Potsdam Institute for Climate Impact Research (PIK). From 2008 to 2015 he served as one of the co-chairs of the Intergovernmental Panel on Climate Change (IPCC) Working Group III "Mitigation of Climate Change". As evidence they occasionally cherry pick from an article by Ottmar Edenhofer, then the co-chairman of Working Group III on solving climate change (mitigation) of the Intergovernmental Panel on Climate Change. He was describing the political reality and explained why "the owners of coal and oil are not enthusiastic" about fighting climate change when he wrote: "We redistribute de facto the world’s wealth by climate politics." The quote comes from an interview in the Swiss Newspaper Neue Zürcher Zeitung. So I can use my comparative advantage of knowing a little German. Fortunately people in Switzerland merely speak Swiss German, Schwyzerdütsch, they write standard German, Hochdeutsch, which is hard enough for a poor Dutch natural scientist. Fundamentally, it is a big mistake to discuss climate politics separately from the big issues of globalization. The climate summit in Cancún at end of the month is not a climate conference, but one of the largest economic conferences since the Second World War. Why? Because we have 11,000 gigatons of carbon in the coal reserves under our feet – and we can only add 400 gigatons more to the atmosphere if we want to stay within the 2 °C target. 11,000 to 400 – we have to face the fact that a large part of the fossil reserves must remain in the ground. De facto, this is the expropriation of the countries with these natural resources. This leads to an entirely different development than the one that has been initiated with development policy. First of all, we as industrialized countries have quasi expropriated the atmosphere of the world community. But one must explicitly say: We de facto redistribute the world’s wealth due to climate politics. That the owners of coal and oil are not enthusiastic about this is obvious. One has to free oneself from the illusion that international climate politics is environmental politics. This has almost nothing to do any more with environmental politics, [as is was with] with problems such as deforestation or the ozone hole. That is a wordy way of saying that climate policies have large economic implications and that these impact different countries differently. For most governments economics is more important than the environment. That means that the world leaders sit at the table and not the environment ministers. Ironically in the sentence most often quoted by the mitigation sceptics Ottmar Edenhofer is expressing understanding for the owners of coal and oil. They were used to violating the property rights of others without paying for it, the large-scale equivalent of dumping your trash in your neighbours garden. Then it is annoying if the neighbour finds out what you are doing, wants you to stop and clean up the mess. Also doing nothing is redistributing wealth: "we as industrialized countries have quasi expropriated the atmosphere of the world community." This is a kind of redistribution social Darwinists may find natural, but it goes against the property rights our capitalism system is based on. That is socialism for the owners of coal and oil. I guess it is natural for people who are willing to pretend that climate science is wrong to defend their political views to assume that people who accept climate science do so for political reasons. That is [[psychological projection]] and Karl Rove strategy #3: Accuse your opponent of your own weakness. My impression is the opposite: most people prefer to be grounded in reality, not just in my science bubble. * Photo of Prof. Dr. Ottmar Edenhofer Chefökonom des Potsdam-Instituts für Klimafolgenforschung by Stephan Roehl licensed under the Creative Commons Attribution-Share Alike 2.0 Generic license. Thanks for revisiting this. A couple of years ago I ran Edenhofer's remarks though Google Translate to obtain a rougher translation than what you provide here. At the time, I thought they were perfectly true, but tactically unwise since they would be cherry-picked or quote-mined by climate change contrarians and conspiracy theorists. Critically, I had only translated the first two paragraphs and omitted the third, which wraps up Edenhofer's ethical and economic argument with a neat logical symmetry. "So here's my inconvenient truth: I think these hard-core ideologues understand the real significance of climate change better than most of the 'warmists' in the political center, the ones who are still insisting that the response can be gradual and painless … when it comes to the political and economic consequences of [the] scientific findings, specifically the kind of deep changes required not just to our energy consumption but to the underlying logic of our liberalized and profit-seeking economy, the have their eyes wide open." So Ottmar Edenhofer is simply agreeing with this appreciation of the implications. "… the ideological warriors … concluded that there is really only one way to beat a threat this big: by claiming that thousands upon thousands of scientists are lying and that climate change is an elaborate hoax." Not so sure Edenhofer agrees with Klein. Edenhofer more likely agrees with liberal values and a large part of the economy being based on profit seeking. Climate change can be perfectly solved in open societies with capitalist markets. The problem is crony capitalism. For William Connolley capitalism seems to be the goal and the profit principle a replacement for many moral considerations. For me markets are just a very powerful tool, a tool that complements free societies, but the aims should be decided upon by society. It often sounds as if Noami Klein would like to get rid of capitalism no matter what. Those are different visions of what a good society looks like, how humans are and what is possible. In all these world views we can solve climate change. The losers of solving the problem would be (older) egoists, crony capitalists and social Darwinists. You misread my comment Victor. Klein was observing that the denialists at Heartland and elsewhere understood the huge implications of CC to the economy better than most 'greens'. I was saying that Edenhofer understood the huge implications of CC to the economy. One might say that it is bleedingly obvious. They almost certainly don't agree on the response to this understanding, but it is odd that Edenhofer is attacked for stating the bleeding obvious! Yes, 6% of the economy changing ownership is a big deal. Because you cited Klein and because many mitigation sceptics say that capitalism is threatened I had interpreted "huge implications" as more than 6% of the economy changing from the old money establishment to entrepreneurs, but as a change in the way we live and work. I think the greens are aware they are fighting an economically powerful machine. No: capitalism is not a goal. It is at best a tool. Also I think you're making the usual non-distinction between capitalism and free markets but the two are distinct. Free markets are indeed a goal because they are s subsdt of freedom. And freedom is a goal. Freedom is a goal. For me free markets are a tool. In a highly unequal world, free markets do not optimise freedom. A minor inconvenience for a billionaire can economically be worth more than the life of a poor person. VV: "Climate change can be perfectly solved in open societies with capitalist markets. The problem is crony capitalism." I agree that anthropogenic climate change can be solved in open societies with capitalist markets, if purchasing elections were illegal; flooding the public sphere with professionally-crafted bespoke disinformation ought to be legally restricted too, or least clearly labeled as deceptive. However, it should be clear that capitalist markets will always externalize every cost they're allowed to get away with. If externalities were always easy to cost, collective intervention in 'free' markets could eliminate Dramas of the Commons. It seems plausible to me, though, that the incommensurability of socialized (including environmental) costs with the private benefits of goods and services is what has driven 'civilization' since the invention of agriculture released Homo sapiens populations from local ecological carrying capacity. WC: "freedom is a goal." Right, it's not a suicide pact. Unless you're a deontological libertarian, that is. Everyone else is a consequentialist libertarian.